I stamped my flowers on Kraft card stock, and added some buttons from PTI, and baker's twine from The Twinery. The leaves were punched from a Martha Stewart leaf punch, and the patterned paper comes from Echo Park "Holly Jolly Christmas" 6 x 6 pad. My sentiment comes from Paper Smooches, and I did some paper piercing with my mat stack from SU!. Hope you all enjoy the simplicity, and the colors as I do. Oh wow, this is really pretty! I love how the buttons are a design feature and coordinate so well with your ink colors! 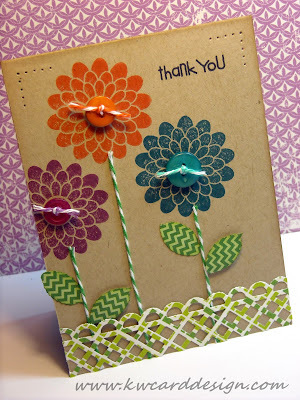 I'm so glad you linked this beauty at Lily Pad Cards! those colors on the kraft look so vivid, it's lovely. I love the little garden fence you made with the border punch... so creative! Adorable, Kari! Love all the sweet touches, like the twine stems, the lattice fence, and of course the button centers on the flowers! 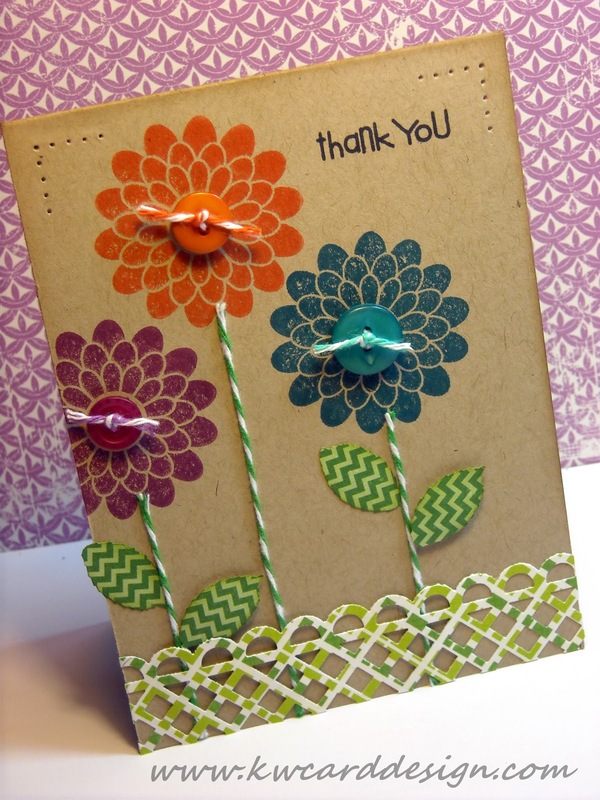 Thanks so much for joining us at Lily Pad Cards!